I know that Christmas was more than a month ago; however, I am just getting around to enjoying one of my presents. I think I am a pretty simple and easy person to buy for. 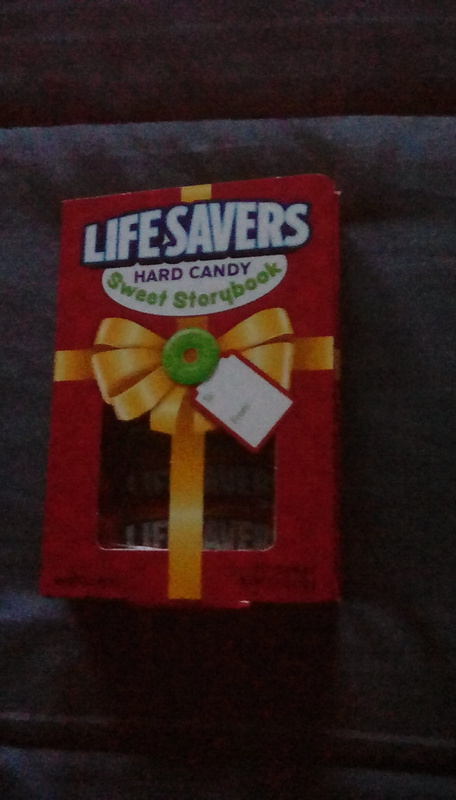 One of my sons gave me a Life Savers Hard Candy Sweet Storybook. This is a gift that I have received off and on since I was a child and I have always been quite happy to receive it. As a book, the plot line is rather thin and short. It is a rather contrived story about how the five fruity flavors of Life Savers had powered the reindeer on their trip around the world and saved Christmas. Gee, I always thought it was Rudolph and his nose so bright that averted a December twenty-fourth crises. I will enjoy the six rolls of five flavor Life Savers which, according to the nutritional information on the back, will yield 42 servings of Life Savers of 2 pieces or, in my case, about five servings of one roll. Here I will risk sounding like the crotchety old guy that I am slowly but steadily becoming and say that the Sweet Storybook ain’t as good as it used to be. While this may be a familiar refrain from someone my age, in this case the assessment is indisputable. First of all today’s storybook is one-sided with six rolls of five flavor Life Savers while the storybook of my childhood was two-sided with five rolls on each side. That is a whopping forty percent reduction in the number of rolls of Life Savers. Secondly, today’s storybook includes six five flavor rolls. The storybook of my childhood had more variety. If I recall correctly, there were two rolls of five flavor, two rolls of wintergreen, two rolls of pep-o-mint, two rolls of cherry and two rolls of butter run. As a kid, I think I ate the five flavor rolls last because they were my least favorite in the bunch. Pep-o-mint was probably my favorite. Perhaps there have been production issues with pep-o-mint because the impetus of the crisis mentioned in the aforementioned story of the storybook is a lack of peppermints for the reindeer. I do appreciate the gift and I will enjoy the Life Savers. My teeth and my diet probably appreciate the fact that there are six instead of ten rolls. Yet, I will still say that this is one item that ain’t what it used to be. This entry was posted in Humor and tagged Life Savors on January 31, 2017 by Leonard. It’s amazing how these companies always find a way to cut corners. I think they probably cut out the Pep-o-mint flavor because mint isn’t as popular among children these days.